We're seven days away from the release of Deadpool 2. The Marvel Legends series released to coincide with the movie features seven figures. So you know what? Deadpool Week! You could say he is, but this toy sure isn't. It's, like, half a package at best. This is a plain vanilla Deadpool, which isn't entirely unwelcome, since the one that was released just two years ago wasn't terribly easy to find. "High demand for the character" and all that. This one is built on the... body we haven't come up with a name for yet ["be sure to like and comment below!" --ed. ], which is just bulky enough to suit him - when I saw the pec hinges, I thought this was going to be the Spider-Man body, but maybe they're saving that for a "first appearance" Deadpool further down the line. The head is new, and it may be the best one a 6" Deadpool has ever had. Nothing against the last one, mind you: it was very good, too. This one has both eyes the same size, and lacks the little flap on the back of the head, as is accurate for the older costume style the toy is wearing. There's no unmasked head, which leads us to the real fault with this release: the accessories. The reused body is accessorized with cuffs on the wrists and ankles, plus a fully unique belt/chest strap piece that even gets DP's old-fashioned friendly-eyed belt buckle. And a strap of pouches around his right thigh. So that's all cool, but as for actual accessories, as in "the things an action figure can hold and use," all he gets are his swords. Just his swords. No guns, no knives, no bombs, no... anything. One sword, two sword. That's all. 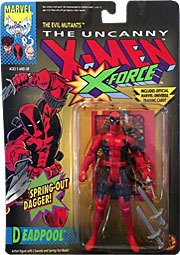 It's possible that's a reference to the first-ever Deadpool figure from 1992, which also only came with two swords, but come the hell on, man: this figure doesn't even come with a Build-A-Figure piece, and yet it costs the same as every other toy in the series? Not cool! 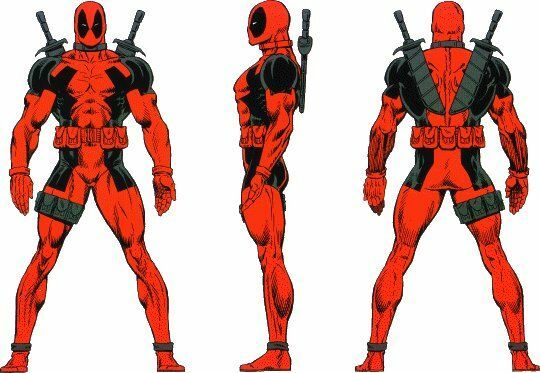 Deadpool isn't a bad figure, not by any stretch of the imagination; but he's also not "the total package." We'd tell you to wait for a sale or a markdown, but what are the odds that a plain Deadpool will last on the pegs that long? 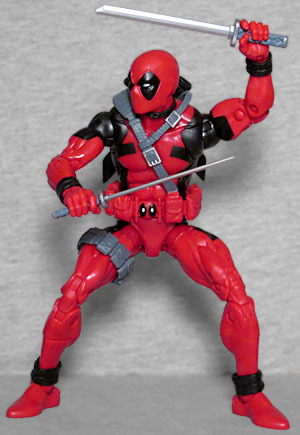 This entry was posted in blog exclusive review, Hasbro, Marvel and tagged Deadpool, Marvel Legends, X-Men. Bookmark the permalink. It rankles me that this is essentially a The Circle Chase era Deadpool yet he has the logo belt buckle he wouldn't wear until his ongoing. Marauder Inc. has a new line of 1:12 weapons that will work well for this guy. Isn't this figure a first-appearance DP? "maybe they're saving that for a 'first appearance' Deadpool further down the line"